Beautiful certificate from the Springfield, Mount Vernon & Pittsburg Rail Road Company issued in 1853. 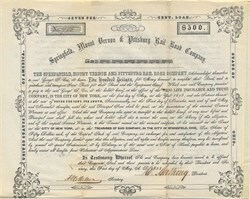 This historic document has an ornate border around it with a vignette of a railroad train. This item has the signatures of the Company's President and Secretary and is over 156 years old. The Springfield, Mt. Vernon & Pittsburg Railroad ran from Delaware, Ohio through Mt. Vernon to Millersburg and ultimately became part of the Pennsylvania Railroad Company.